Offering versatility and ergonomics, the Jungheinrich EZS 350 Tow Tractor has the ability to hitch several trailers together providing added flexibility in most material handling operations. The forklift’s high performance is due to the AC drive motor which provides powerful acceleration and high travel speeds with significant energy efficiency, longer operating times and low maintenance. The primary ergonomic features are the low stand-on platform for frequent mounting and dismounting and the short distance from the operator platform to the load. The lift truck’s JetPilot steering wheel, supportive backrest and automatic speed reduction system, Curve Control, all provide comfort, control and stability. 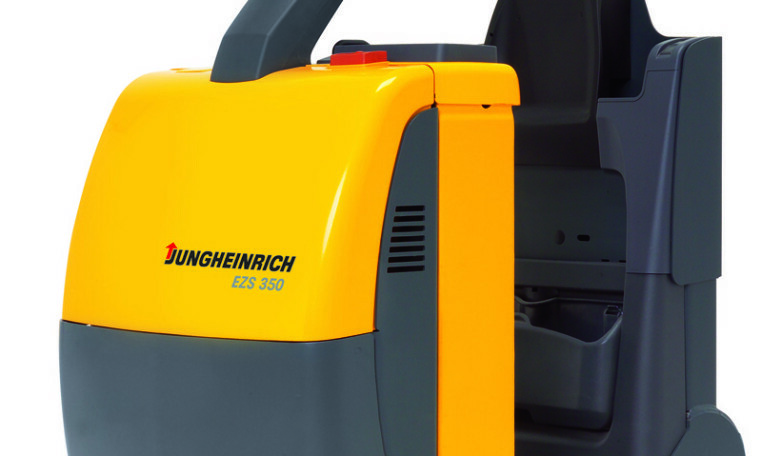 Jungheinrich AC motors provide increased efficiency and reduced operating costs. No carbon brushes to replace–for a nearly maintenance-free drive motor. SpeedControl, an impulse controller, and Curve Control, for automatic speed reduction when turning, work together to facilitate controlled, smooth travel and provide adjustable drive characteristics for every application. The requested travel speed is maintained in every travel situation–on both upward / downward grades. 3 pre-set, adjustable travel programs allow for adjustment to suit any application. Regenerative braking with energy reclamation during deceleration. Programmable Curve Control ensures the tow tractor always remains under control. Suspended, stand-on lift truck platform with low step height for frequent mounting and dismounting. Padded backrest with grab handle and kneepad in operator compartment. Short travel distance for the operator from the driving position to the hitch or load. The tow hitch can be seen from every position and is easily accessible. Electric steering and programmable Curve Control with JetPilot steering wheel. Solid-pneumatic load wheels provide smoother lift truck travel and reduced vibrations. Forklift chassis made of high-quality 0.31 inch thick steel plate. Extra high bumper on front chassis protects the motor compartment from possible impact damage. Energy-saving AC technology combined with battery capacities up to 750 Ah provide long operating times. Three-color LED battery discharge indicator as standard or optional “CanDis” information display with 10-bar visual charge indicator, hour-meter and service code display. Optional “CanCode” keypad allows for secure truck activation via PIN and includes 3 pre-set travel programs. When combined, CanDis and CanCode allow for quick adjustment of the forklift speed, acceleration and motor brake parameters without a laptop. Forward / reverse pedestrian touch control. Rubber or steel tow tractor bumper. Extended backrest with flip-down seat (adjustable to 3 different height positions). Traction and non-marking drive wheels.